Deputy Prime Minister Barnaby Joyce was in town on the election trail to announce a $5m boost for stage two of the multiplex project. Hinkler MP Keith Pitt and Bundaberg Mayor Jack Dempsey welcomed the promise. In order of appearance: Barnaby Joyce, Keith Pitt, Jack Dempsey. 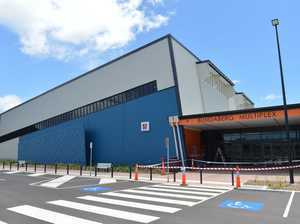 News BUNDABERG mayor Jack Dempsey has promised 80% of the build will go to local builders.